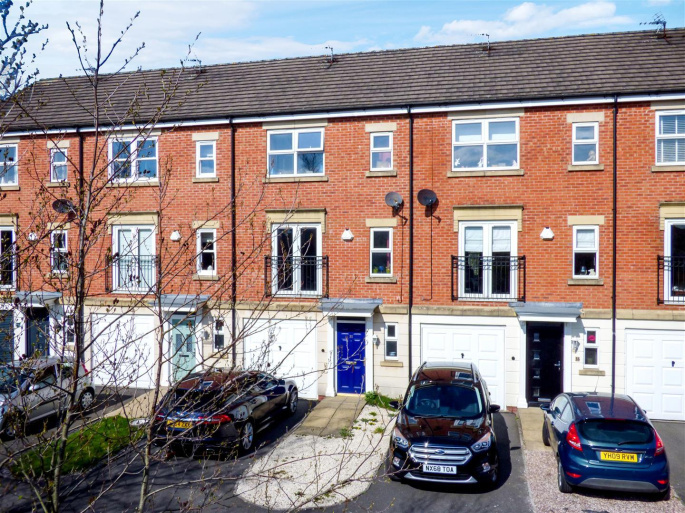 *** EXCELLENT OPPORTUNITY *** To acquire this modern THREE bedroom three storey townhouse with PRIVATE back garden, GARAGE and TWO dedicated off-road parking spaces. EN-SUITE. UTILITY. DOWNSTAIRS WC and a very spacious open plan LOUNGE DINER. 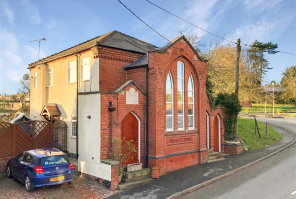 Offering an impressive 1,200 square feet of space, the property also offers; a spacious entrance hall, TWO double bedrooms and one single, a FITTED kitchen with integral oven and hob and a good sized family bathroom. 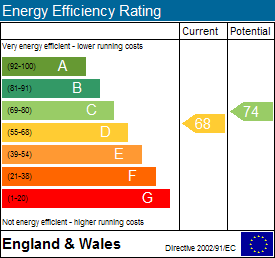 Gas central heating and UPVC double glazing throughout. 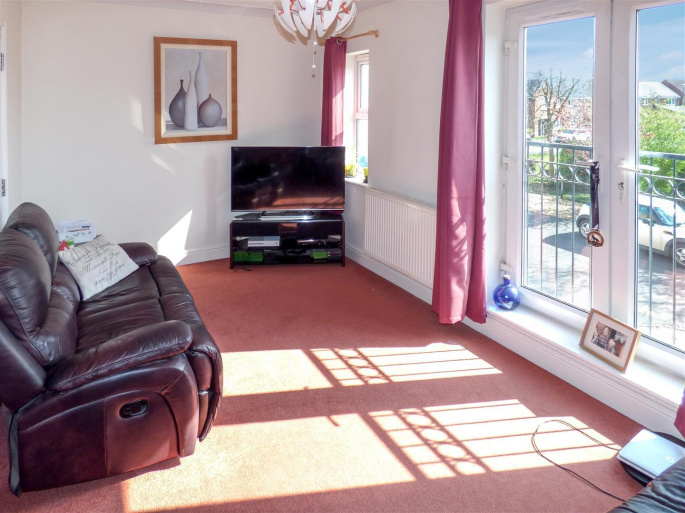 The property is ideally situated over looking a central communal children's play area on this popular development built in 2003. 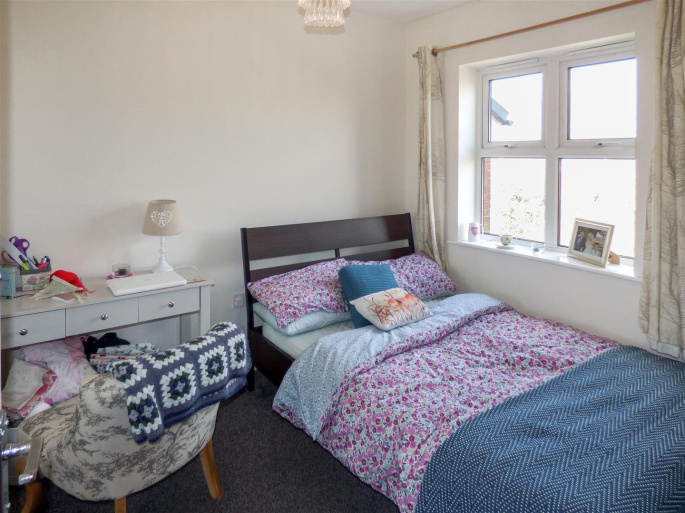 The village of Ibstock offers a broad range of amenities and excellent commuting via the M1. The approach to the property is via a short cul-de-sac road serving these few town houses. 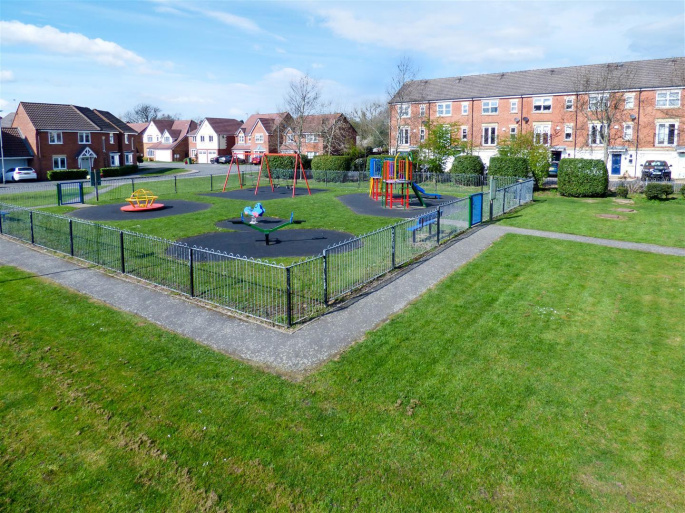 There are two dedicated parking spaces in front of the property and the small piece of garden area between the car parking bays and the communal play area also belongs to the property. There is a security light and a canopy porch over the composite front door which takes you into the entrance hallway. 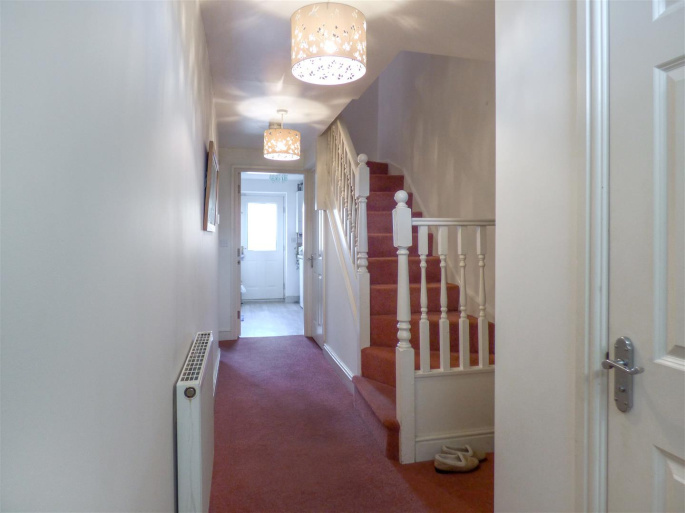 Once inside the property there is a long and spacious hallway with a handy alcove for coats and a shoe rack, an under-stairs storage cupboard, a door bell chime, an alarm entry-exit panel, one central heating radiator and two ceiling light fitting points. 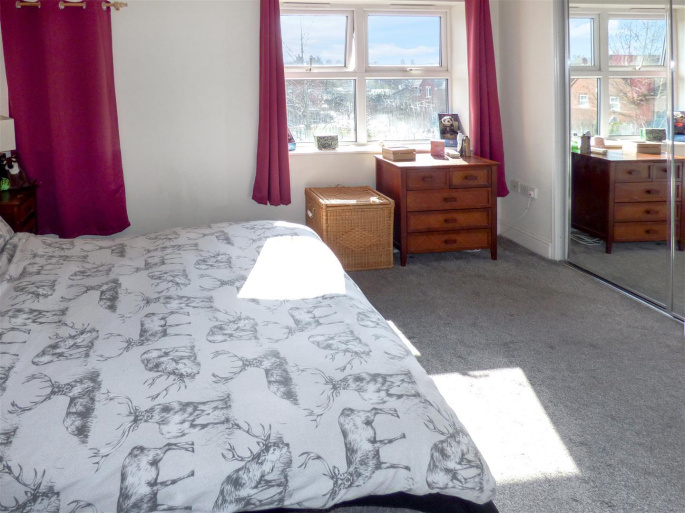 On the ground floor to the rear of the property is the third bedroom which is a double room with double glazed UPVC French doors leading out to the patio and the rear garden. You will also find a telephone point, one central heating radiator and one ceiling light fitting point. 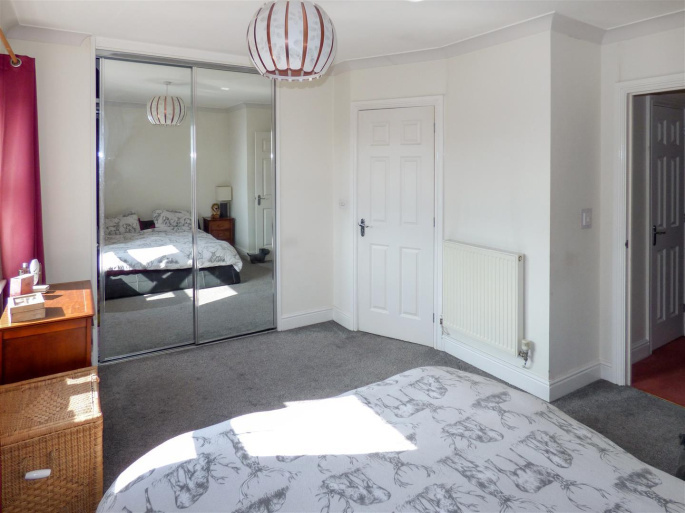 Also on the ground floor at the rear of the property is the spacious utility room with a white double glazed UPVC door leading out to the rear garden and a range of base and wall units finished in a pale pine wood effect with brushed steel bar handles. There are light pine effect work tops with sand coloured splash-back tiles above and spaces for three appliances below. 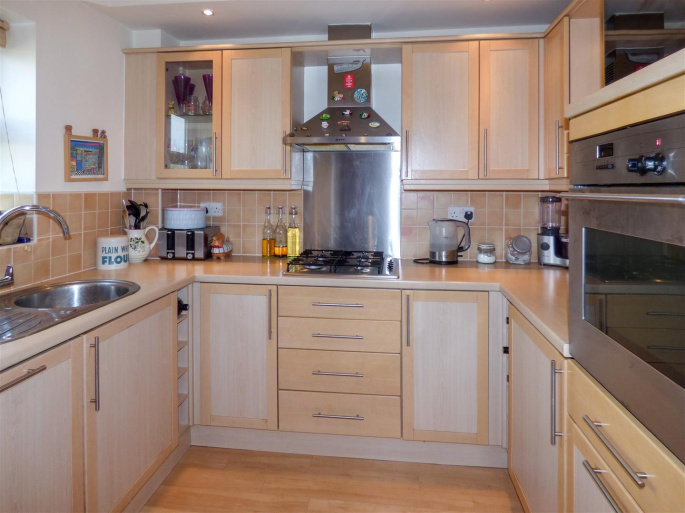 You will also find a stainless steel sink, drainer and chrome mixer tap, an extractor fan, one central heating radiator and one ceiling light fitting point. 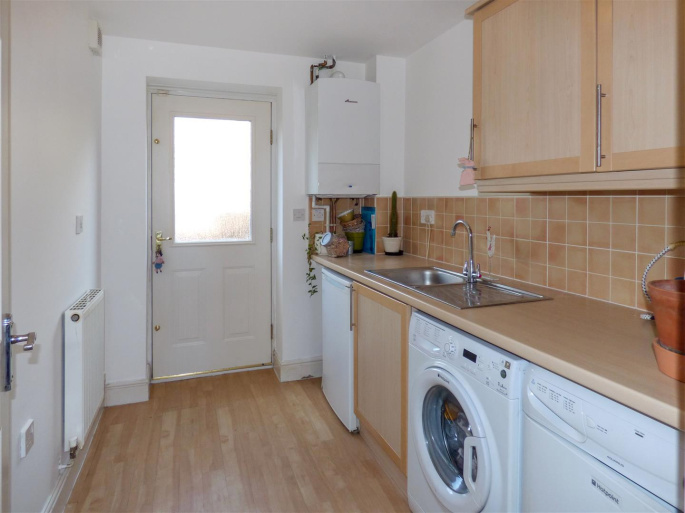 ** The utility room houses the gas boiler which was replaced in May 2018 with a Worcester boiler **. 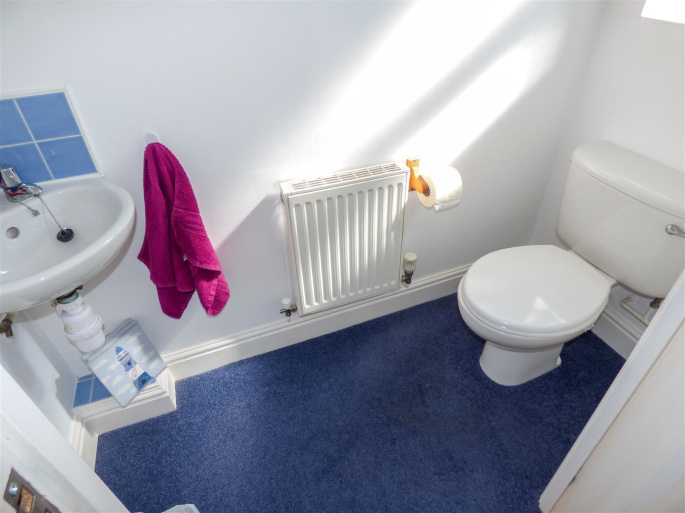 At the front of the property you will find the downstairs WC fitted with a white wall-mounted corner sink with two chrome taps and pale blue splash-back tiles above and a white low level WC with a chrome handle. 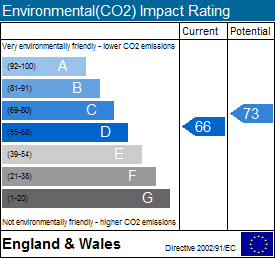 There is a double glazed UPVC window to the front aspect with frosted courtesy glass, one central heating radiator and one ceiling light fitting point. On the first floor at the front of the property is the spacious family lounge area which has double French doors leading out to the Juliet balcony over-looking the park, a small double glazed UPVC window, two telephone points, one TV aerial point, decorative coving to the ceiling, one central heating radiator and one ceiling light fitting point. 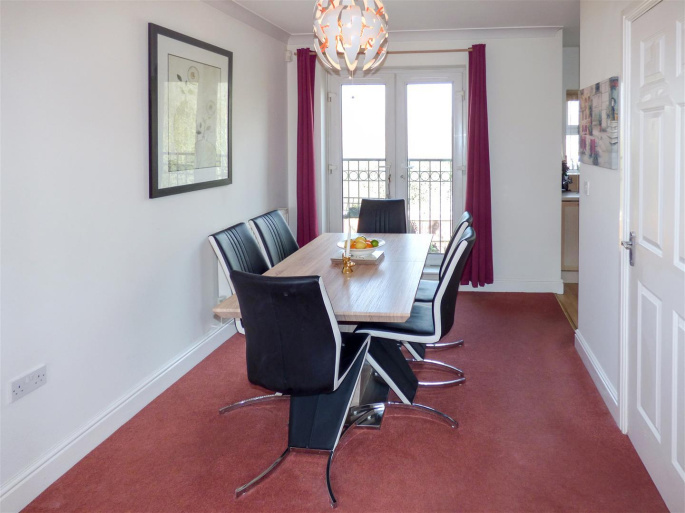 Open plan from the lounge area is a really good sized dining area which has double French doors with a Juliet balcony over-looking the back garden, decorative coving fitted to the ceiling, one central heating radiator and one ceiling light fitting point. There is an opening through to the kitchen. The modern kitchen is fitted with a range of base and wall units in pale pine wood effect with brushed steel bar handles. One of the wall units is an attractive glass-fronted display cabinet. The work tops are a light pine wood effect with sand coloured splash-back tiles above and there are two fitted bottle racks and a four-drawer unit. You will also find a chest height integral electric oven and grill, a fully integrated dishwasher, integrated fridge, a four-burner gas hob with a brushed steel splash back panel and an extractor hood above. There is also a stainless steel sink, drainer and a chrome mixer tap, one double glazed UPVC window to the rear aspect, and eight sunken ceiling spot lights. This landing has another alarm entry-exit control panel, one central heating radiator and one ceiling light fitting point. 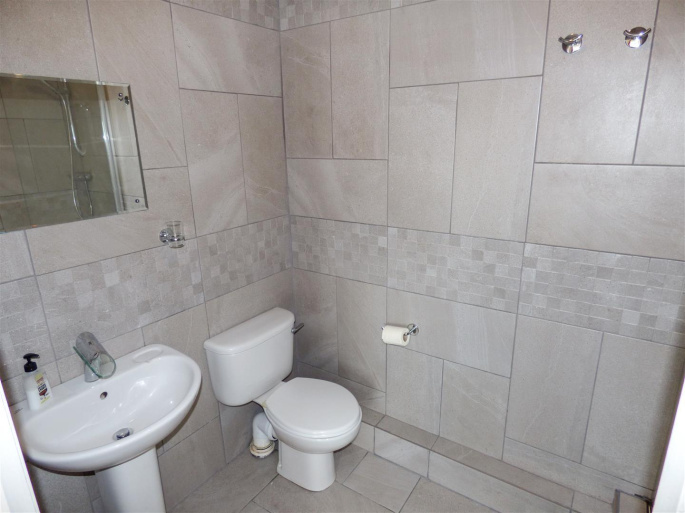 The en-suite is a generous size and has the floor and walls fully tiled in grey stone effect ceramic tiles with a mid-height chequered border. 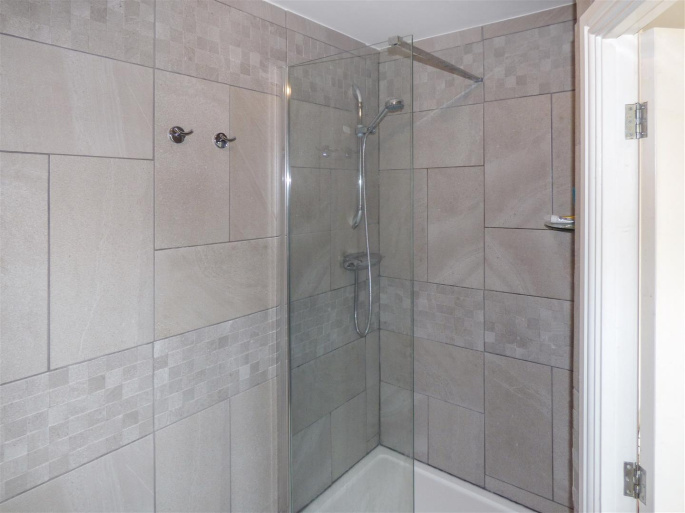 There is a large walk-in shower with a glass screen and a chrome wall-mounted shower and riser. You will also find a white low level WC with a chrome handle, a white pedestal sink with a chrome waterfall style mixer tap, a chrome wall-mounted heated towel ladder, an extractor fan and one ceiling light fitting point. 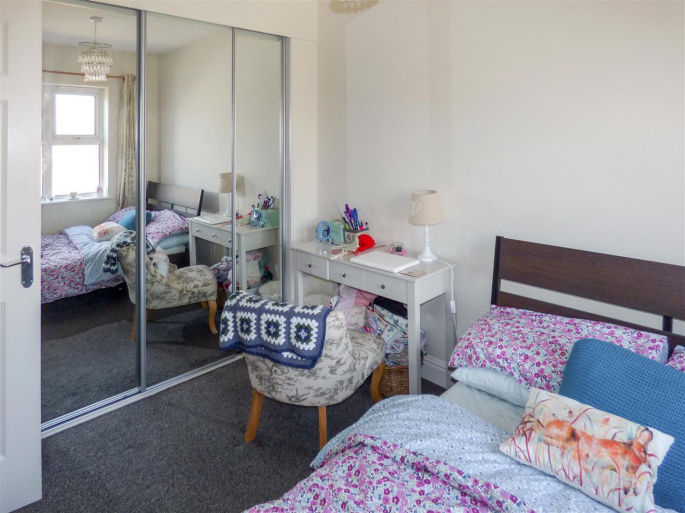 The second bedroom is also fitted with built-in wardrobes with sliding mirrored doors and a shelf and hanging rails inside. 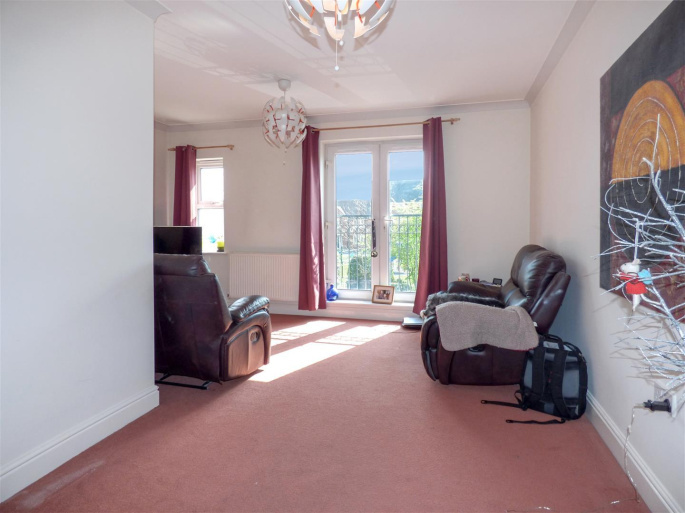 There is an access hatch to the loft space, a TV aerial point, a double glazed UPVC window to the rear aspect, one central heating radiator and one ceiling light fitting point. 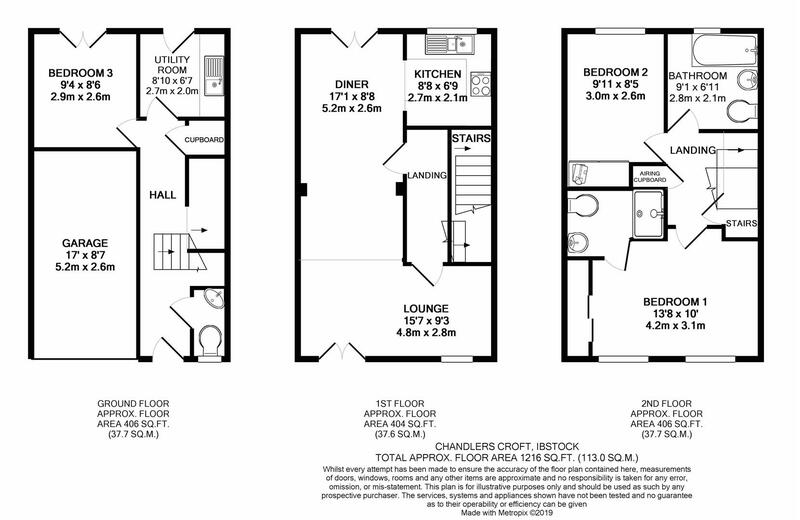 ** Please Note: The loft is partially boarded down the middle and has a light and power sockets fitted. 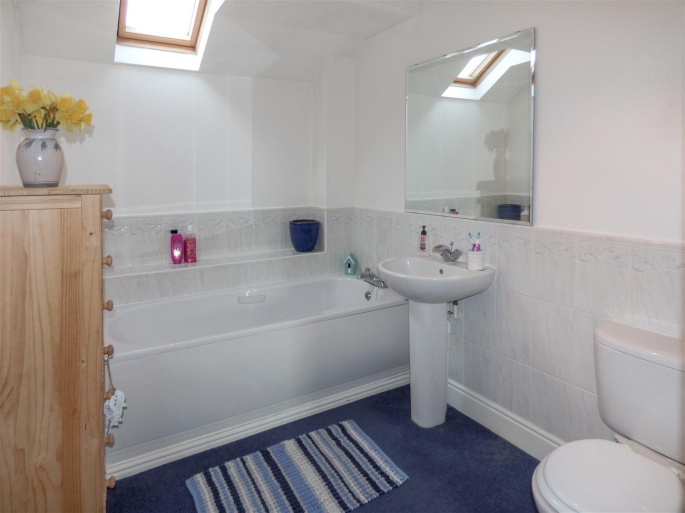 There is a good sized family bathroom with an apex roof and a roof skylight window. There is a white suite comprising; a bath with a chrome mixer tap, a low level WC with a chrome handle and a pedestal sink with a chrome mixer tap. 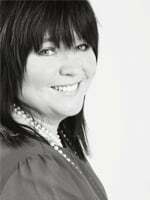 There are off-white pale blue patterned ceramic wall tiles around the bath, sink and WC. 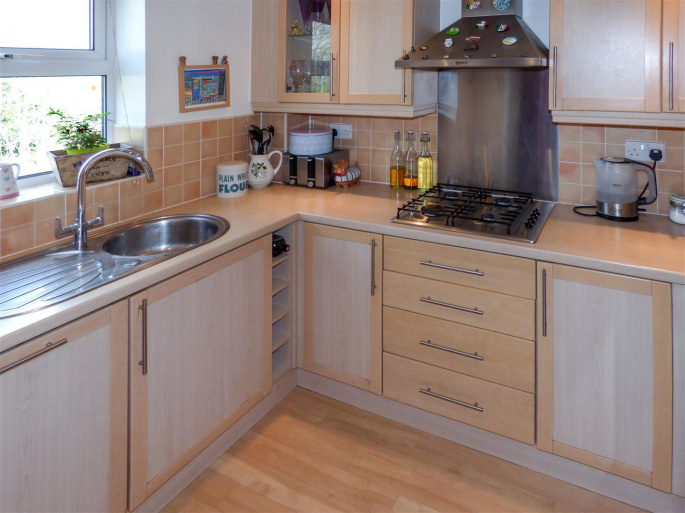 You will also find an extractor fan, one central heating radiator and one ceiling light fitting point. 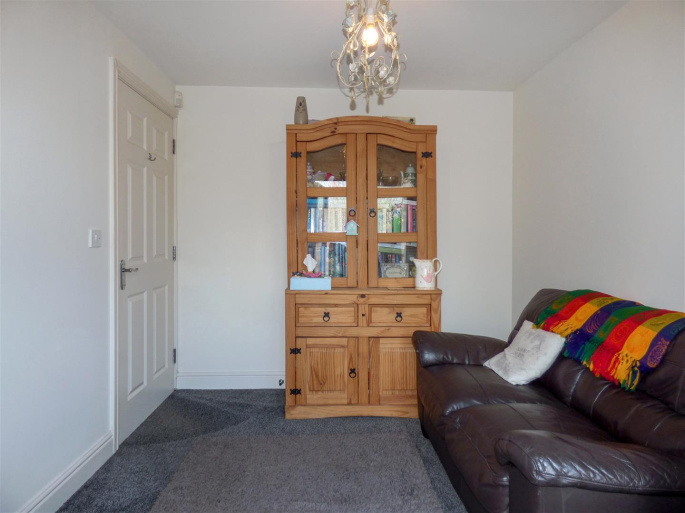 On the second floor landing you will find an airing cupboard with fitted shelves and one ceiling light fitting point. The integral single garage has an up-and-over metal door and houses the gas, electricity and water meters, the property fuse board an alarm sensor, electricity power sockets and one ceiling light fitting point. 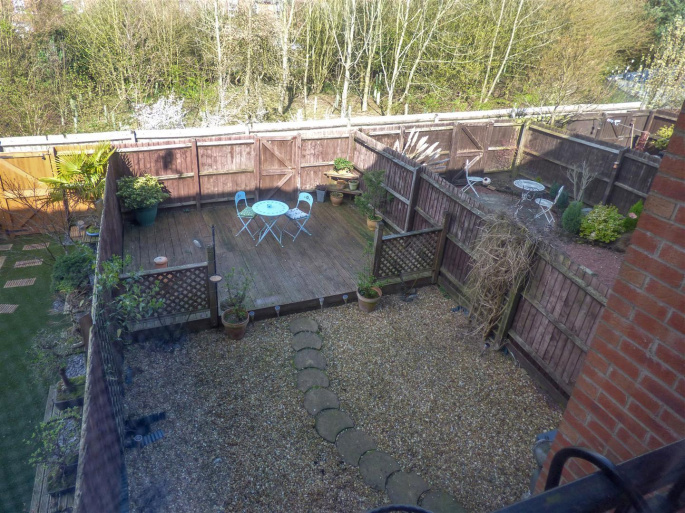 The back garden has paved patio areas outside the utility room and the third bedroom and is largely laid with gravel and there is a slab path leading to a raised wooden decking area with a gate at the back with access round to the front of the block. There is also an outside cold water tap and a security flood light.